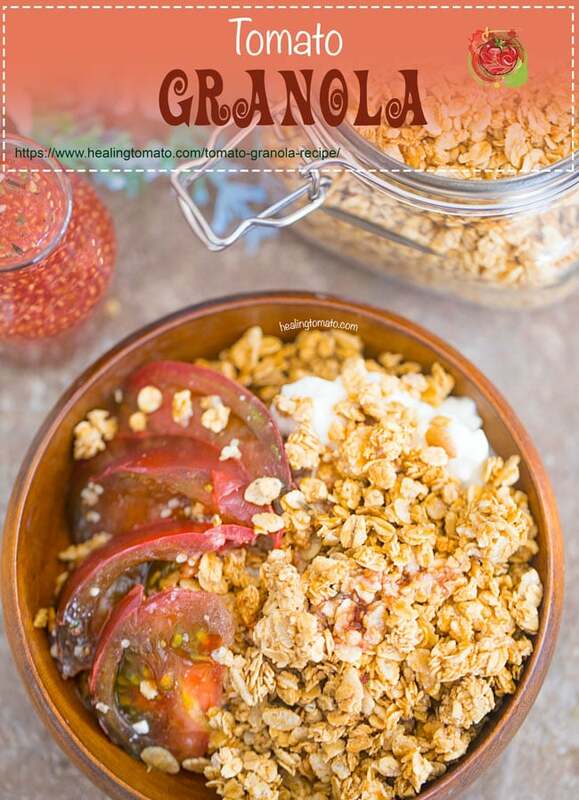 Tomato Granola Recipe made with heirloom tomatoes and a simple raspberry chia kombucha dressing. 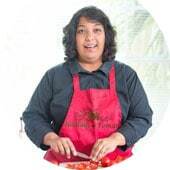 I used oat and honey granola because it compliments the tomatoes subtle flavor. This granola is the perfect breakfast or light lunch recipe. This post is sponsored by Cascadian Farm and Annie’s Organic Products. All opinions are my own. 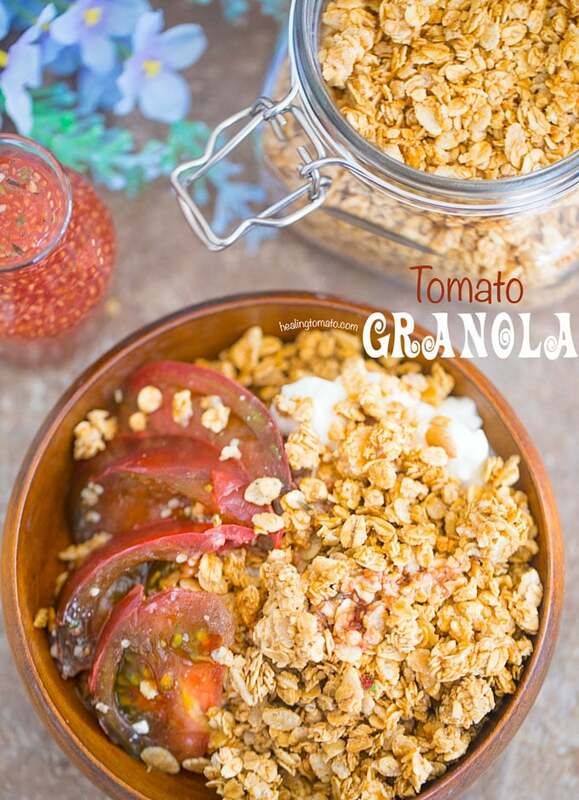 Have you tried granola with tomatoes? 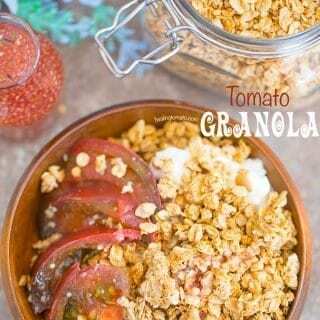 Now, I can say I tried tomato granola and it is sooo good! When I first came across Cascadian Farm Oat and Honey granola at Walmart, I thought it looked interesting enough to become my regular granola recipe. I took it home and tried it right out of the package. It was so good and different from the other granola recipes I had tried before. I like its natural taste and it was also not sugary sweet. I figured that this was a granola that deserved a very unique recipe! Whenever I am at Walmart, I will always spend most of my time at the produce section going through all their wonderful selections. It never surprises me to see that they have fresh produce which I can stock up on without breaking my bank account. This time, I saw some heirloom tomatoes that were so colorful and looked like they were picked from the vine minutes ago! I liked the dark purple colored heirloom tomatoes which I don’t get to see often. I grabbed them and brought them home to see if I could pair them with the oat and honey granola. After a few experiments, I finally got the right combination of ingredients and this tomato granola recipe was born! Rounding out the flavors was my favorite kombucha drink. Most of the Walmarts near me have an organic and vegan section where I get the most interesting products. I discovered raspberry chia kombucha there and it’s now my favorite drink. I have used Cascadian Farms and Annie’s products for a long time. I use their granola bars for my weekly snack preps. Being vegetarian, having organic products in a my pantry is really important to me. I am one of those people you see in Walmart who is reading the back of each product to see the ingredients. I can spend an hour just in the cereal aisle reading all the ingredients in granola cereals. From the list of ingredients in Cascadian Farms’ Oat and Honey Granola, can you guess my favorite? Sure, the organic whole grain oats are so delicious! But, I loved that they use rice in this granola. As you know, I have a lifelong love affair with everything rice. Any granola recipe that uses it is going to be #1 in my book! So, don’t just take my word for it. Run to Walmart and pick up a whole bunch of Cascadian Farm Organic Oats and Honey Granola! 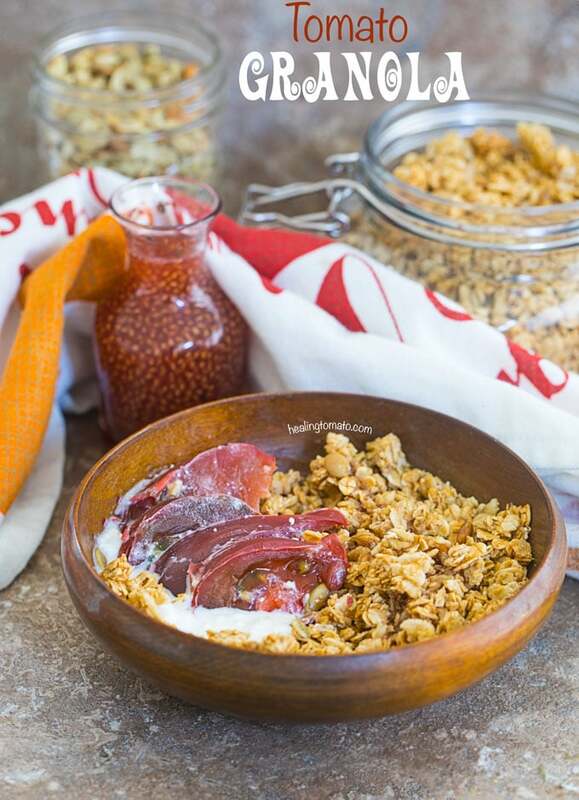 Make this tomato granola and tell me what you think. 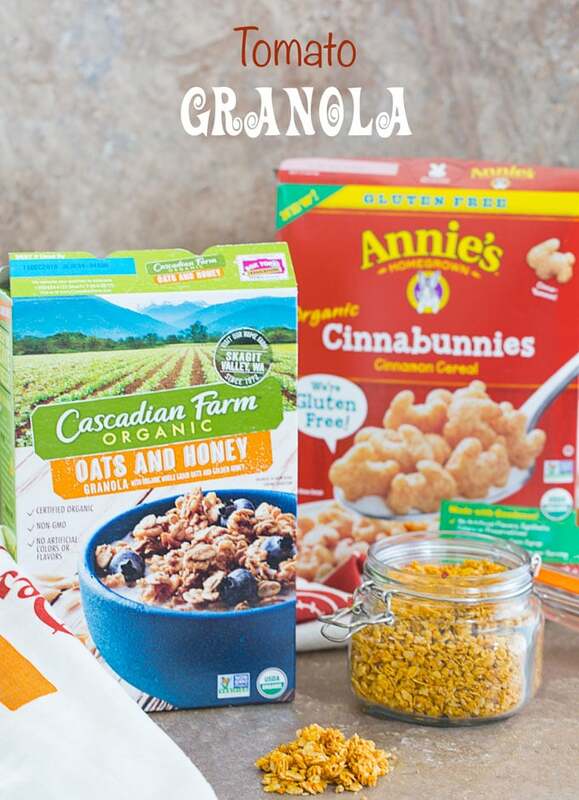 If you have kids that love cereals, they are going to love Annie’s Organic Cinnabunnies! Even big kids like me, love the taste of this cereal, but, I will never admit it! What’s your favorite granola recipe? Do not assemble the kombucha dressing until about 5 minutes before you use it. Kombucha is fermented and loses its power quickly when exposed to air. If you take this tomato granola recipe to work, wait till you are ready to eat before you assemble the dressing.